If adequately maintained, there is no reason why a properly designed solar canopy wouldn’t last 40 to 50 years. 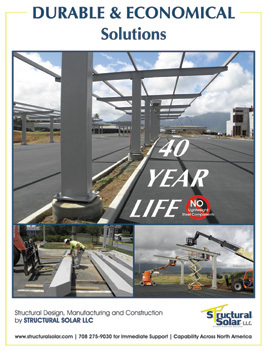 According to Robert Pegnato with Structural Solar LLC, the life span of a solar carport is a function of managing corrosion requiring both good “structural” design and proper “coating” of the metal. Corrosion or more specifically oxidation via galvanic reaction requires several conditions be present. First there must be an electrolyte (i.e. water, moisture, acid, etc.) that allows for the migration of atoms and electrons to flow from one metal to the other or from one part of a single component to another. To the extent that good physical and structural design eliminates or minimizes locations where water can reside, a vital condition for corrosion has been eliminated. That’s why it is important to look at connection and structural detail closely. Contact (in fact “quality of contact”) with dissimilar metals is another important consideration that will be discussed later along with the relative surface of anode to cathode area. Structural Solar is a leading supplier of solar carports across the country and the company is typically cited by its clients for its attention to detail and uncompromising commitment to long term durability. According to Pegnato, Structural Solar designs its carports with heavier tube and structural sections as opposed to light gauge roll formed sections. Lightweight sections like roll formed C and Z purlins typically have an upturned lip which while it contributes to its strength, also acts to retain water and sets up a favorable condition for corrosion. As an outdoor solar structure exposed to the elements, the minimum expectation of durability needs to be “low or no maintenance for 20 to 25 years”. Light pre-galvanizing, cold galvanizing or paint coatings alone will not provide that type of performance if design and connections are not adequately considered. As stated above, corrosion relies on migration of atoms and electrons across the surface of a metal, aided in part by an electrolyte (liquid). Corrosion resistant paint finishes act to stop or isolate this migration by insulating the metal. Structural Solar LLC utilizes an industrial marine grade paint finish. It is a shop-applied 3 part coating system. The multi-step process starts with a near white (SSPC-SP6) shot blast to clean and prepare the fabricated structure for the coating. The 3-Part coating involves a zinc rich primer, an epoxy intermediate coat and a polyurethane top coat. Individually these coatings provide a barrier to corrosion. Used together, they form a thick (9-14 mil) dry film multi-barrier to protect the steel from oxidation. According to technical specifications by Sherwin Williams, this type of Industrial Marine grade finish rates 15,000 hours according to the generally accepted ASTM B 117 (accelerated corrosion test method). An alternate to the Industrial Marine grade paint finish is to have the structure HDG (Hot Dipped Galvanized) according to ASTM A123. While it might be considered by some as “less aesthetic” for a particular project, it is a centuries old, time tested protective coating for steel and it’s been accepted visually for municipal and commercial applications across the globe. Unlike paint systems, HDG does not rely on being a barrier to corrosion but rather as a sacrificial anode to the steel (iron) that it protects. Essentially, galvanize is a pure zinc coating and zinc preferentially oxidizes relative to steel. Since the coating / deposition of zinc is significant and on all surfaces, there is little opportunity for oxidation to occur to any extent on steel surfaces. In other words, even if there is an exposed area on the steel or a scratch through the HDG surface, zinc will effectively migrate to the affected area and protect against deeper corrosion. Likewise and for the same reason, a self-tapping fastener or drilled hole through the galvanized coating is not a reason for alarm. The relative volume of zinc (anode) to exposed steel (cathode) is substantial enough to provide anodic protection to the steel, thus providing for decades of low or no maintenance service. The figure below is published from the American Galvanizers Association and clearly demonstrates that adequately galvanized metal surfaces are durable for many decades even despite aggressive coastal environments. Moreover, Structural Solar designs many structures with heavy structural shapes or mechanical tubing and then hot dip galvanizes such that both the INTERIOR and EXTERIOR of the tube sections receive the same heavy coating of zinc, thus providing the steel component with additional protection and anodic capacity. When such sections are closed, the company fabricates with interior chase ways that allow the molten zinc to flush through and exit as it is hot dipped i.e. submerged in a bath of molten zinc. Typical fabricated components are shown below. Notwithstanding the prior discussion it is important to recognize that not all galvanized components provide the same level of service. G-90 Galvanizing for example is a common specification for pre-galvanized steel strip and tubing. In effect, some components like most C and Z roll formed purlins are produced from sheet or coil that has been coated with zinc to a level of about 0.90 oz./sf. (hence G-90). By comparison, HDG provides approximately 1.5 to 1.7 oz. (zinc)/sf. Additionally, when C and Z roll formed purlins are made from slitting pre-galvanized coil, 100% of the edges and ends as well as any drilled or punched holes are exposed with absolutely NO galvanize coating at all. Thus it is imperative to rely on the coated surfaces as protection of the uncoated surfaces but not only is the coating thickness less but the anodic capacity is less as well. Accordingly the life of those components is reduced and rust (aka oxidation, corrosion) will be become evident sooner. Finally and as noted early, C and Z purlins on exposed structures tend to hold / trap water which sets up the potential for accelerated corrosion. The photo below of a competitive structure with C purlins shows early signs of corrosion and staining even though it was recently installed. Since there is no “roof”, water sheds directly from the modules to the structure beneath. This is typically not a problem unless of course water is able to reside within the C purlin. For the structure above, modules are directly fastened to a lightweight galvanized purlin via a tek screw and mid clamp. That means each module is handed up and fastened to a prior erected structure which in itself is a time consuming process. But more directly, the aluminum frame of the module is in direct contact (“clamping pressure”) at (4) points with the galvanized steel purlin which raises a question. Will there be a galvanic reaction at the interface between the aluminum and galvanized surfaces? The answer is of course “yes” but the reaction may not be evident for some time. Below is a chart of “galvanic” potential between different metals. Near the top of the list, i.e. the most “reactive” metals are zinc (galvanize) as well as 5000 and 6000 series aluminum. That means they are both relatively reactive but “similar” in terms of their “dissimilarity”. Conversely, the farther the metals are from one another on the chart, the more dissimilar they are and the more the reactive the less noble metal will oxidize. Finally, to the extent there is dissimilarly, it is important that the more reactive anodic material have much larger surface area (anodic capacity) so as to prevent localized and accelerated reactions. Accordingly, on one hand and based on the above chart, it is unlikely that there will be an immediate and adverse reaction between the solar module frame and the galvanized steel purlin. On the other hand, the solar modules are warranted for 25 years and might last 40 years or longer so the structure should have comparable design life and any structural design or practice that inherently reduces the potential for corrosion without increasing cost must be favorably considered. To this end, Structural Solar uses heavy wall tube purlins and attaches aluminum rails /racking above the purlins. Accordingly, aluminum framed solar modules are attached directly and only to aluminum rails and there is no dissimilar metal reaction between the modules and racking. There is no standing water. There are no exposed (uncoated edges) and accordingly, there is virtually no corrosion and associated maintenance costs. Economic reality and cost is essential to any meaningful discussion of quality and to the extent there is a question of cost, Solar Developers or Owners must simply “do the math” based on their standards, applicable labor rates, experiences and site specific conditions. Further, it stands that the critical metric must absolutely not be the ”Cost of Materials” but at a minimum, the “Total Installed Cost (with modules in place)”. Quite often, lightweight structural systems have lower cost of materials delivered to the site but have more foundations, shorter spans, more field welded and bolted parts and accordingly higher installed cost. And there is more overall surface area with correspondingly greater potential for corrosion. By efficiently leveraging the strength of steel and the functionality of aluminum, Structural Solar believes and has demonstrated that it’s possible to achieve structures with both the highest durability AND the lowest installed cost. Even more appropriate would be an analysis of the “Total Cost of Ownership “ which not only takes total installed costs into consideration but also the cost of capital, depreciation and all associated maintenance over the structures life span. In this type of analysis, quality is often reflected as a financial value such that the total investment and return is effectively “risk affected”. According to Pegnato, there are no shortcuts and no secrets, just efficient design, manufacturing and execution. Any Solar Developer or Owner with a long term view of their business and a reputation for quality needs to carefully consider structural detail, specifications, risk and total cost of installation or ownership.